In the electronic cigarette world there seems to be no taboo when it comes to companies copying each other’s designs. When a good idea hits the market, it’s typically only a matter of a few months before all the major players are introducing their versions of it. The V-Tox from Vision is an example of a product that appears to be an almost exact copy of another manufacturers product. In this case it does add one welcome improvement, however. The Kanger EVOD was one of the first bottom coil changeable (BCC) clearomizers to really become popular with electronic cigarette users thanks to its consistent performance and easily replaceable coil heads. If imitation is the sincerest form of flattery, then Kanger should be proud. There have been a number of EVOD look alikes lately and the V-Tox from Vision is the latest. I need to pause for a moment here and ask a question about product naming. Who came up with Tox name for an electronic cigarette accessory? Is it just me, or does any derivative of the word toxic sound like something you don’t necessarily want to put in your mouth? Naming aside, the designers at Vision did a good job with the V-Tox, which is to say that they made a pretty accurate copy of the EVOD, which has already proven to work well. No more need for market research there. 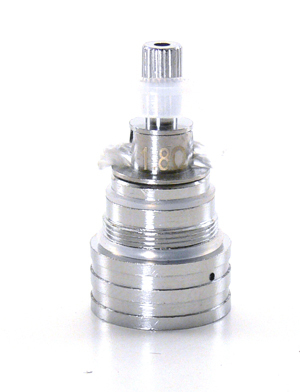 The coil head assembly in particular appears to be an exact copy of the EVOD and is interchangeable between the two. The wicks do appear to be just a bit longer than those of the EVOD. The base that the coil head screws into is slightly different, with horizontal grooves rather than a smooth appearance. There are two holes for airflow, which seems to improve upon the somewhat airy draw EVOD which has three. It has an eGo style connection with only the outside threads, so it will work perfectly with eGo batteries, but will need an adapter to connect to a standard 510 connection. The body of the tank is where Vision did differentiate their product a little by using four viewing windows. The EVOD only has two on opposite sides of the center tube. It doesn’t sound like a big deal, but the four windows actually make it much easier to see e-liquid levels in low light. Especially with clear juices, it is sometimes very difficult to see the level in an EVOD since the center tube blocks light from passing the whole way through. 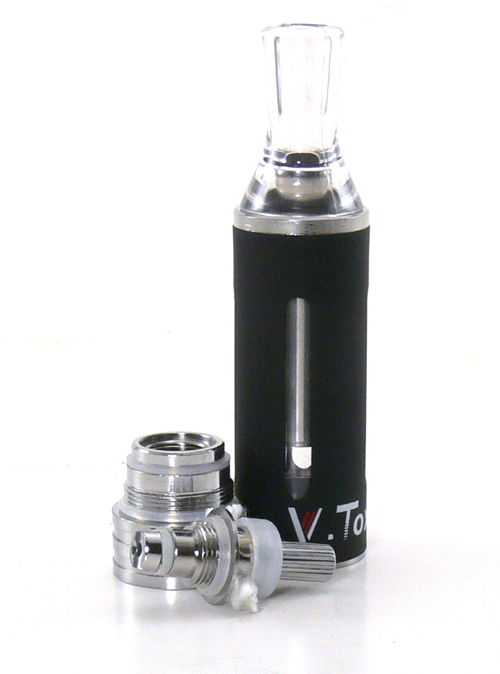 In use, the V-Tox performs quite well, right on par with the EVOD it emulates. Flavor and vapor are very good and it provides a decent throat hit. Wicking was nearly flawless, with a little extra priming needed only when the tank was freshly filled. Unlike most BCCs I’ve tried, I did not need to remove any wick from the included head for it to work well with my 80PG/20VG e-liquid. The draw on the V-Tox does seem slightly stiffer than the EVOD, which will probably please most vapers. I have actually used a little tape to cover two of the holes on some of my EVODs to make the draw a little stiffer. There was no need to do so on the V-Tox. The resistance on the supplied coil registers at 1.7ohms, very close to the 1.8ohm that is clearly marked on it. The unit worked well on a variety of devices from eGo style batteries to variable voltage devices. Vision has done a good job mimicking the EVOD and patent rights arguments aside, that’s a good thing. 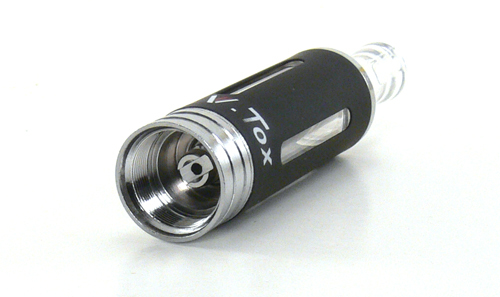 Electronic cigarette buyers have embraced the design of the EVOD and should enjoy the V-Tox just as well. The added viewing windows even make it slightly more functional. What it really does for Vision is give them a good product to sell along with their well regarded Spinner batteries and a combination of the two should make for some good starter kits. At $6.00 from Viper Vape, the price is also a about the same as the EVOD and while it doesn’t break much new ground, it’s at least another good choice for veteran vapers and new ecig users alike.